How to Make Compost at Home? Yes, I succeeded to move past my apprehension and embark into this new world of composting at home. And I am LOVING IT!!!!!!!!! I cannot tell you how good it is making me feel and it is surprisingly quite simple. How much space do you have both internally and externally? Are you living in a unit or a house? Do you have a small or large outdoor area? Who will it effect? Ie pets/young children/neighbours/landlord? Where will you place the composting system? Do you want to have the internal bins close to your cooking space so that the food peels and scraps can be readily disposed of? Or hidden away? Do you have a garden space that attracts the sun? A flat space? Hidden away? Pathway, paved area, garden bed? How much waste do you produce within your home and garden? How much time and money do I want to invest? Do you want to build one yourself out of wood, buy an inexpensive slow cycle stationary one or invest in a low maintenance quick turnaround tumbling one? You may even choose to have a combination of these options. My current set up is that we live in a relatively humble size house with a large garden. We have two young children and a dog and life is super busy. I wanted minimal commitment, minimal effort and minimal investment for my minimal waste. I have found through this exercise that my household consistently produces roughly half a caddy a day in organic food waste. I was surprised at how much there was when I first started collecting as I didn’t believe I was throwing away that much food to landfill but I quickly saw that it added up. It consisted mainly of the peels and cores from the vegetables & fruit we consume, the crusts from the bread my children don’t eat, the tea leaves, the mouldy food, the leftover scraps from dinner, or lunchboxes and breakfast. Click here for a free printable on what basic household items can be added to your composting bins. Further our large garden produces several lawn mower catchers per week of grass and garden clippings. A 7 litre Kitchen caddy for inside our house. You can purchase this item here. A 140 litre twin continuous compost tumbler outside in our garden. You can purchase this item here. A 300 litre free standing stationary compost bin outside in our garden. You can purchase this item here. 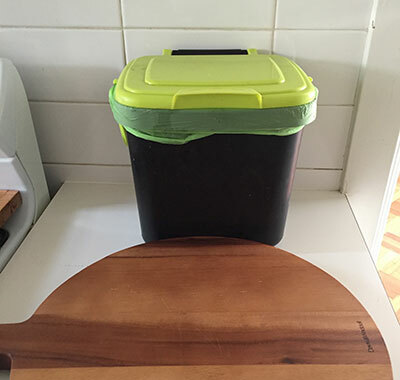 Kitchen Caddy: I collected my waste for a week and weighed it each day to work out that 7 litres was the right size for our household. The caddy I chose has a lockable lid so that it prevents any odours and avoids tipping waste over. I also purchased some 7 litre compostable bags to line my caddy, to keep it clean and to make it easy for me to transfer outside. I have placed it on my kitchen bench next to my chopping board so that I have easy access as well as a constant reminder when cooking/cleaning to dispose of the organic waste effortlessly. It is quick: As tumblers allow for maximum aeration of the waste they can make compost twice as fast as a standing bin. It is continuous: It has a two chamber design so I am able to fill up one side of the bin while the other side is maturing. This results in a continuous supply of compost. It requires little maintenance because the rolling action of the tumbler ensures it is easily aerated. As long as I spin it each time I fill it up (every second day) then that is all that is required. The tumbler is easy to spin and minimal manual labour is required…no elbow grease or back breaking wanted here!! 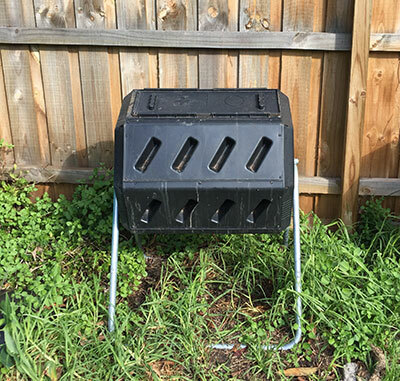 It is easier to spin because firstly it is a compact unit and secondly because it is a horizontal turning compost bin not a vertical one which means that the weight of the waste inside does not need to travel as high. I didn’t choose a bigger tumbler for this reason as it would be harder to turn and harder to empty. 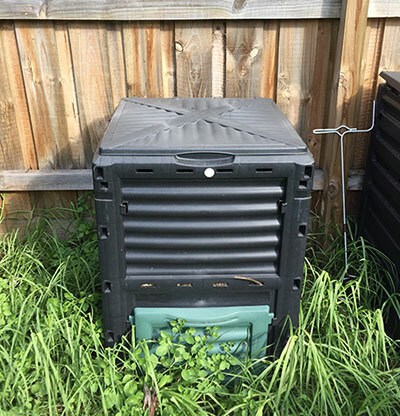 I placed the compost tumbler at the back of our garden as it has great access to sunlight which can warm up the compost bin and can assist to move along the harvesting process (this is why in summer composting is quicker than in winter). Further, it is the furthest point in our garden from the house so that if it starts smelling or attracts fruit flies it is far away. Let’s face it as a novice I am unlikely to get the recipe spot on to begin with and until I master it this is the reality of what is likely to happen!! I decided I needed two compost bins outside our house due to the excessive grass clippings we produce from our large garden. Please note however, that if our garden was smaller it would be fine to use just the one unit. I chose the tumbler for the food waste and a stationary unit for the garden waste. 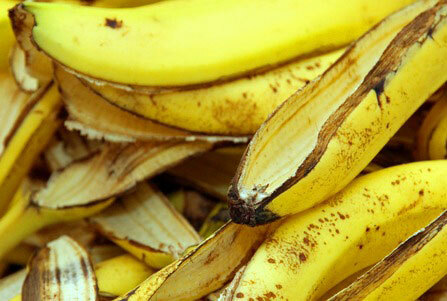 This is due to the fact that food waste, as opposed to garden waste produces the most nutrient rich compost. I really wanted access to the rich compost quickly and steadily whereas I the garden waste can work in a much more suitable slower system. Are there any other decisions you have to make before moving forward? Who will be the one responsible for looking after it? If you need a reminder click here for the 4 reasons we should all be composting at home!!! Would love to hear about your specific set-up and let me know if you have any queries.